Lamb, artichokes, and dried fruit are a classic combination for a Moroccan tagine, but it is the bouquet of spices—saffron, cumin, ginger, coriander, cinnamon—that make this dish memorable. 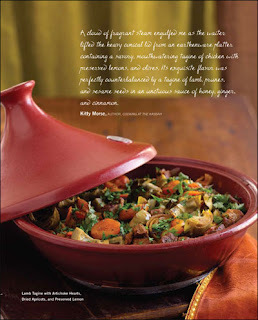 To savor the wonderful flavors in the sauce, spoon the tagine onto mounds of fluffy couscous (page 317). This recipe calls for browning the lamb, which you can do in a tagine if it is has a stainless steel–clad or castiron base. If your tagine is all earthenware, simply toss the meat with the ingredients and simmer in the tagine over low heat. Alternatively, brown the meat in a skillet and transfer it to the tagine for simmering, or prepare the entire dish in a Dutch oven or braiser. 1. Place the lamb in a large bowl, sprinkle with the salt and pepper, and toss to coat evenly. Set aside. 2. Heat a stainless steel–clad or cast-iron base of a tagine (see headnote for alternatives) over medium-low heat and add the olive oil. When the oil is hot enough to sizzle a piece of onion, increase the heat to medium, add the onion wedges, and cook, stirring, for 10 minutes, or until they wilt and begin to turn color. Meanwhile, in a small bowl, stir together the saffron, cumin, ginger and coriander. 3. Add the meat, carrot, and cinnamon to the onion, increase the heat to medium-high, and cook, stirring constantly, for 5 minutes, or until the meat begins to brown. Add the chicken broth, tomatoes, parsley and cilantro stems, and the saffron mixture and bring to a boil. 4. Place the lid on the tagine, decrease the heat to low, and cook, without disturbing the cover, for 1 ½ hours, adjusting the heat to keep the stew at a gentle simmer. 5. Meanwhile, if using fresh artichoke hearts, fill a medium bowl half full with water; squeeze the juice from a lemon half into the water, and add the spent lemon half to the water. Working with 1 artichoke at a time, pull the leaves back and tear them off where they meet at the base (bottom), until you reach the pale green inner leaves. (Reserve the leaves for another use.) Turn the artichoke on its side on a cutting board and, with a chef’s knife, cut the attached leaves off just where they meet the base. Cut the stem off the base and reserve. With a paring knife, trim the dark green outer layer from the base. With the tip of a spoon, scoop the fuzzy portion from the center and discard. Rub the trimmed artichoke bottom with the remaining lemon half. Cut the bottom into quarters and add to the lemon water. Peel the fibrous outer layer from the stem and cut crosswise into ½-inch lengths. Add to the lemon water. Repeat with the remaining artichokes. 6. After 1½ hours, test the meat for tenderness. It should be fork-tender. If it isn’t, simmer it a little longer and test again. 7. When the meat is tender, drain the fresh artichokes and add them, or add the frozen artichoke hearts, and the apricots. Re-cover and cook for 30 minutes, or until the fresh artichokes are tender, or only 10 minutes if using frozen artichoke hearts. Stir in the preserved lemon. 8. If the stew is swimming in liquid, use a slotted spoon to transfer the solids to a bowl, cover with aluminum foil, and place in an oven set at 200°F. Boil the liquid, uncovered, for 10 minutes, or until reduced slightly. Return the solids to the tagine. 9. Sprinkle the finely chopped parsley, cilantro, and mint over the top. Re-cover the tagine and carry it to the table.